My husband and I have started renovations of our master bedroom and in the process of cleaning and moving items I discovered this fun snowflake hat that I didn't even know I owned. Of course as soon as I put it on my hubby teased me and said "What, are you a snowflake now?" He's so silly. Today I have a mix of old and new items I purchased this season. Everything I have on is old except the burgundy shirt and booties. The top I picked up at JCP because I needed to spend just a few more dollars so I could use my coupon. It was on sale for $7.00. I really like the color, the thin material and the loose drape. It's a V-neck. I was going to take pictures of it without the scarf and sweater, but it was just too darn cold. My scarf has been in my wardrobe forever. The sweater I picked up at Zara a season or two ago. I really like the shape of this sweater. It is longer in the back and curves shorter in front. 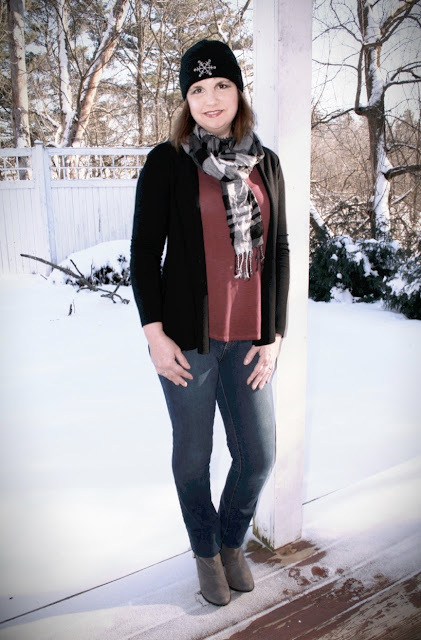 My straight leg jeans are from Stitch Fix. I learned from a reader of my blog to cuff the jeans to the inside if I want to shorten my pant legs to show off my booties. That was such a good tip. I love it when my readers give me valuable advice like that. Whenever I cuffed my pants on the outside it made my legs look shorter and heaver. But if the cuff is turned to the inside, it gives a nice, lean, finished look. You're probably so tired of seeing me in hats and scarves, but unfortunately it's just too cold here in Wisconsin to live without them. Plus, I just bought about three more new ones so be warned: more hat and scarf posts are yet to come! You can really make some interesting discoveries when you spend some time digging through your closet and reorganizing. The old items you discover can create a whole new look when mixed with some new pieces. White and Black Plaid Scarf, old, similar HERE, and Blowfish Suba Bootie, DSW, grey color no longer available, but other colors available HERE. Good to hear, as I think I will be wearing them for awhile yet! It's been quite the winter. I live in tuques and scarves- love the outside with snow pictures! Thanks! It's been so difficult trying to take pictures this year. The snow is so deep I can't go into my yard to take pictures, so I have no choice but to take photos on the porch. Such a cute beanie!! I love that it has the added detail, too. And I'm sure you're tired of it, but I love all that snow! Thanks Shauna! Yes, I am so tired of the snow. Mostly because it has affected out lives too much this season. Haven't been able to get out much due to bad road conditions. It's all about hats and scarves this time of year! I like the little snowflake on your beanie! Thanks Ruth! Yep, hats and scarves for me probably until May! I love hats and scarves, and I love seeing you wearing them! Isn't "finding" things in your closet that you had forgotten about wonderful! Especially when they are as cute as your hat! Pretty scarf, too. I like the entire outfit. Thanks Andrea! Yes! I love to "find" things in my closet. It's as if I got something new but never had to pay anything for it. What a great find with that hat Amy!! I keep thinking I should knit myself a solid colored one that would be more versatile! I just bought a sock monkey one---and it's fun but very loud!! Thanks Jodie, I've never seen a sock monkey hat before, I would love to see what that looks like! I'm all about cute hats and scarves this time of year! This is such a cute winter look! How do you do that? You always look so cute! Thanks for linking up to Top of the World Style. Awww, thanks! You're so sweet! You have been nailing these cold weather looks of layered sweaters, scarves and beanies. Damn it is cold and a lot of snow in Wisconsin. Thank you! Yes, our winters are terrible. I keep looking at other bloggers outdoor fashion photos and I wonder "Where is all their snow?"